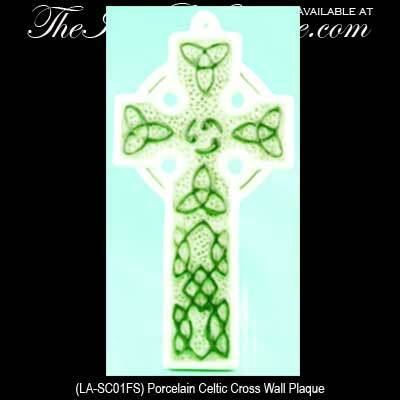 Celtic cross for the wall is a small design that is made of green accented white porcelain and features Trinity knots. This green and white porcelain Celtic wall cross features a knot-work motif that includes the Trinity, it measures 2 3/4" wide x 5 1/2" tall. The small Trinity wall cross is gift boxed with Celtic knot and Celtic cross history cards, complements of The Irish Gift House. Celtic cross is made of green and white color porcelain and features knot-work that include the Trinity. Celtic wall cross features the Claddagh symbol in the center. Irish blessing wall cross has a vertical row of embossed Celtic knots. Celtic wall cross features a dove along with a blessing and knot-work.